Business can be stressful. You don’t have to let the stress of the moving business run your life. With so much responsibility of owning a moving company, it’s easy to allow yourself to get stressed out and overwhelmed. What is that stress costing you and your business? You already know stress isn’t good for your health, but it’s also bad for your business. When you’re stressed out, you’re not as effective of a leader as you could and should be. It’s a long road to alleviate stress completely, but you can learn to manage it and not let it run your life and business. Decide not to be a stress case – It all starts with a decision. 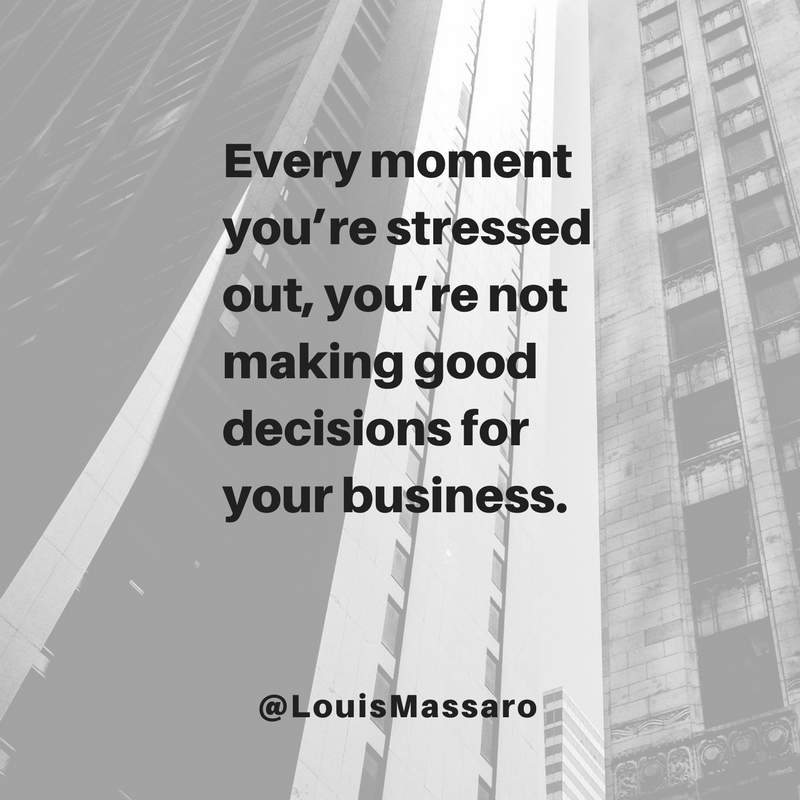 If you want to start running your business without the stress, you have to decide you don’t want to be a stress case. After that, you’ll find better ways of relating to your business and ways to deal with your stress when it comes up. 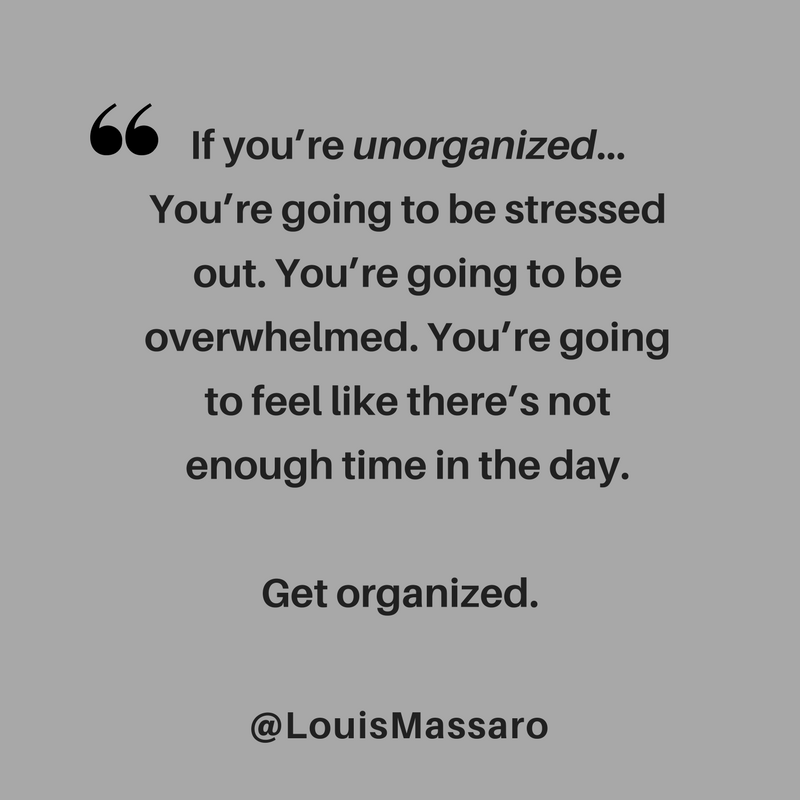 Get organized – If you’re unorganized, you’re going to be stressed out. You’re going to feel overwhelmed. You’re going to feel like there is not enough time in the day. Getting organized is one of the best things you can do to alleviate stress. When you are organized, you can be proactive and not reactive. You can focus and execute around your priorities and accomplish the things that are really going to help you move forward in your business. You want to be able to run your day and not have your day run you. 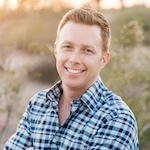 Own your role as a leader – When you make a decision to become a business owner, you’ve got to take the good with the bad. If you want to reap the rewards, you also need to take on the responsibility of everything else that happens in your business. Good or bad, own your role and don’t stress out about it. Release the stress when it happens – Stress won’t go away completely, but you can get rid of it quicker. When situations occur that cause the stress, learn to let it go as quick as possible. Every moment you’re stressed out, you’re not making good decisions as a leader. Take some deep breaths, go for a walk, whatever you need to do to let it go. I realize stress can’t be solved in five steps. If you decide today that you no longer want to run your business as a stress case, you’re taking a step in the right direction. Don’t get discouraged if you try and fall down. Just commit yourself to not being a stress case, and like any new skill, you’ll get better at it over time and with practice. Let the stress go, my friend. 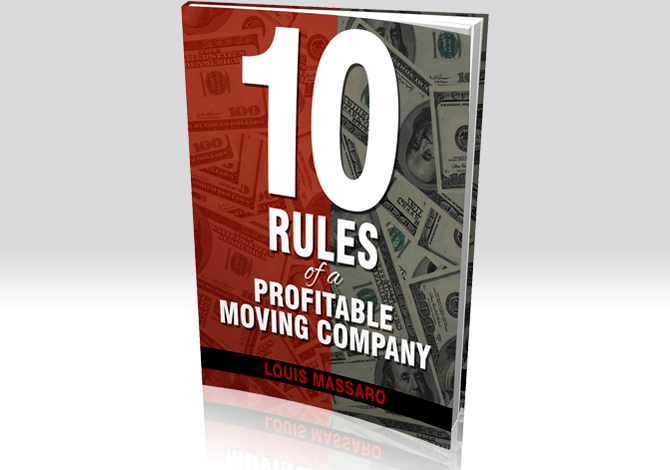 Hey my friend, it’s Louis Massaro CEO of Moving Mastery and founder of Moving Sales Academy. Have you ever been totally stressed out or overwhelmed with work, with your business. Do you feel that way maybe everyday? Is it something that continues to be a problem for you? It’s a stressful business, any business is stressful but the moving business is definitely a stressful business. I know that, I’ve been there, I used to… When I started I was so stressed out, I had ulcers, I was sick to my stomach. I allowed myself to just be stressed all the time. I allowed every circumstance that would happened and every problem that would pop up to affect me. I decided to change that, because it’s a decision. When you stress out, when you get overwhelmed, you may not realize it but you’re making a decision at that point to allow yourself to get stressed out, and to allow yourself to get overwhelmed. As entrepreneurs, as business owners, we talk about I’m stressed, I got everything, all this stuff to deal with, I got all these employees and trucks and it’s stressful. And in reality stress is just a code word for fear. If you really break down stress. If you really take a look at what stress is, it’s all fear. If we don’t cover all these jobs what’s gonna happen? Customers are gonna be upset. So you’re fearful the customer is going to be upset. You’re not gonna make the money that you wanna make for that day. What’s gonna happen if movers don’t show up on a busy day? We’re not gonna cover the work. You get stressed out. You’re fearful of what’s gonna happen? So it’s important to first take a step back and look at what it is, and realize that you know what that doesn’t have to be you. Maybe you’re stressed out because that’s the way you learned, whether you did it consciously or unconsciously, to run your business. Maybe you as a kid you saw somebody running a business and they’re always yelling and screaming and then they were stressed out and just came home and were pissed off. Or you saw it in a movie or a TV show and just that was the stigma of how businessman should be or a business woman should be. But it doesn’t have to be that way and it’s not effective to be that way. 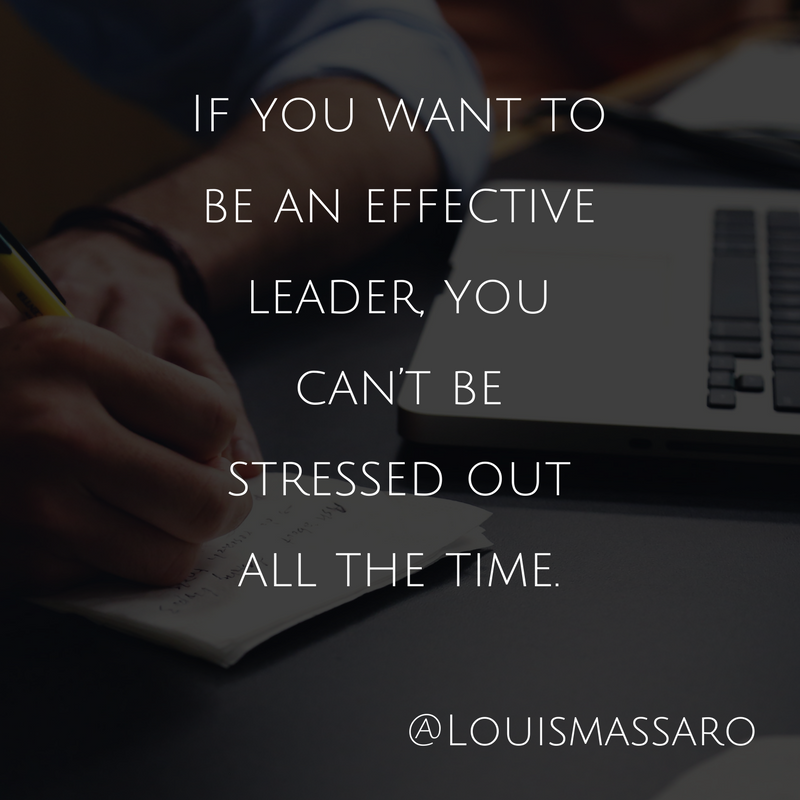 If you wanna be effective leader, you can’t be stressed out all the time. The general of an army isn’t stressed out throwing fits and getting pissed off at people. You gotta keep your composure and if you’re stressed out your decisions aren’t gonna be as good as they could be and should be. Listen, I know it’s tough and there’s no magic bullet to deal with stress but I wanna give you five things, that you can do to help manage the stress of running your businesses. So the first thing is… And this is how it all started for me was; decide not to be a stress case. Make the decision right now that, “You know what? I don’t wanna run my business as a stress case.” And a lot of people will fight me on this. A lot of people watching this are gonna say, “Yeah, but you know what Louis? You don’t know my circumstance. You don’t know what I have to deal with in my business. You don’t know that it’s only me and the employees I have, they don’t do what they’re supposed to do and I barely have enough money to pay the bills every month.” Listen I’ve been there, and I know it and someone who wants to argue for this and say that you don’t know my circumstance. They’re gonna keep looking for drama, they’re gonna keep looking for something to be stressed out about and if you keep looking for something to be stressed out about, you’re going to be stressed out. So first thing is just decide right now in this moment, you don’t wanna be a stress case anymore. You wanna lead your business with a clear head and a clear focus and be there when you get home for your family and not be all stressed out. It’s a better quality of life and you don’t have to be a business owner. You don’t have to go in and run your business and let stress dictate how you do things. Number two, this will alleviate a lot of stress for you, get organized. I’ve talked to a lot moving company owners and I talk to them about, talk to me about your time management talk to me about how you organize things. I ask them certain questions that lead to me finding out if they’re organized or not, because if you’re unorganized you’re gonna be stressed out. You’re gonna be overwhelmed. You’re gonna feel like there’s not enough time in the day. There is plenty of time in the day. There’s plenty of time in the week. There’s plenty of time in the month. There’s plenty of time in the year. But when you’re not organized, you’re acting in a reactive state. You’re not being proactive. You don’t have stuff on your calendar, laid out in order of priority of what needs to get done and what needs to get accomplished. It’s a whole different ball game when you have everything in your mind and you know all these things you need to do. I’m sure you have a ton of stuff you need to get done and a lot that you’re responsible for, I know this believe me I’ve been there. But when you have it organized. When you know what your priorities are and then you put them on your calendar, and let’s say you have something that you know needs to get done and now it’s on the calendar for two days from now or two weeks from now, whatever it is, whatever it lies within your priorities. You can be focused and calm and in the moment and deal with what’s in front of you, instead of worrying about all the stuff that you can’t get it all done right now. So get organized put it on the calendar and do it order of priority, organize and execute around priorities, always. Number three, own your role as a leader. You’ve chosen to be a business owner for better or for worse. There’s a lot of good things that come with it, and there’s also things that can be looked at as bad things that come with it. Or stressful things or overwhelm or responsibility. If this is what you’re choosing, if you wanna own a business, you need to own that role and understand that things are gonna happen. Understand that people are gonna disappoint you. Somebody’s not gonna do their job correctly, you’re gonna have a customer that just is difficult to deal with. Things are gonna happen and that’s your responsibility. If you wanna take home the big bucks, if you wanna be the one that’s not punching the clock, that’s not working for an hourly wage for somebody else, and you wanna own your own business, then own that role and know that there’s gonna be some things that could cause stress that go with that. Not stress, things that could cause stress if you let them cause stress. Own the role… Listen, it’s a penalty of leadership. It’s not all good. There’s other stuff that comes with it. Own it. Next, accept that things are gonna go wrong. Accept this fact. This was one of the best things I ever did. Because you know what? I had offices in cities throughout the country. So everyday, something was happening. Whether a truck flipped over, whether a mover was injured on a job and then wanted to sue for workers comp. All these things if they happen to you, guess what? Chances are they’ll have happen again. Chances are something worse could happen that hasn’t already happened. And if you allow that to throw you off completely, if you allow that to completely ruin your day, your week, your year, whatever, you’re not gonna be in a centered place to be able to run your business as a leader. Accept that things are gonna happen and when they happen, just say, “You know what? That’s just part of being in business.” You could then ask yourself, “What could we do to make sure this doesn’t happen again?” “What could I do to fix this?” But don’t get… Whatever it is, think of the worst case scenario. Think of the worst case scenario. Whatever it is, it could happen. But it’s not the end of the world. And if you think about every moment you’re stressed out, every moment you’re overwhelmed, you’re not making good decisions as a leader. So you need to get away from that as quick as possible. Doesn’t matter what happens, it doesn’t matter. It could be the worst thing, you need to allow yourself to process it, deal with the situation at hand like a leader and then move on. Don’t be a victim and say, “Oh, this happened to me. Everything was going smooth and then the truck got blown with wind off the highway.” That happened me before, totally tipped over the whole box of the truck, with the customer shipment in it, and many other things. Well, they’re gonna happen. Accept that. Last one is release the stress when it happens. I’m not under some false conception here that stress is gonna go away based on what I’m sharing with you today. But what I do know is that you can manage that stress better. What I do know is that when these things happen, when that whatever it is happens, that customer calls and yells, that mover that was your lead guy quits and goes and works for somebody else, whatever it is, that pisses you off, that stresses you out, if you sit at your computer and you’re going through emails and all the sudden you just feel totally overwhelmed, like, “I have so much to do and I can’t get to it all.” Take a step back and tell yourself, “You know what? In this state of mind, I can’t be a leader. 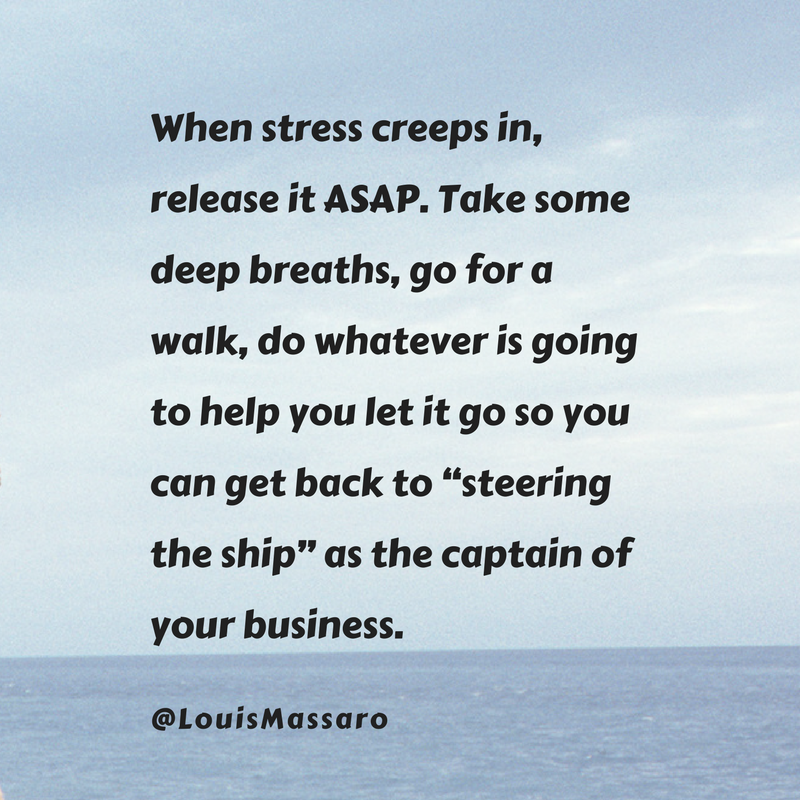 I can’t steer the ship of this company in the right direction if I’m stressed out and overwhelmed and frazzled.” So release it right away. Do whatever you need to do to release that stress, whether that’s sit in your office, close the door and breathe, take some deep breaths, go for a walk, go for 20 minute walk. Just literally walk outside your office, and just go for a stroll and tell yourself, “You know what? I’m in no position to be a leader right now. I need to go and get my mind right because my mind controls everything that happens in my business. And if my mind’s not right, my business isn’t gonna be right.” So the quicker that you can take care of that and release it, the more productive you’re gonna be. Listen, we’ve all had those days where you’re just stressed out and you’re overwhelmed and you let something that happens early in the day ruin your whole day. Think about how much time you wasted that day. Think about all the productive things you could have been doing to move your business forward with that time but you couldn’t because you were so stressed and overwhelmed with that situation. Release it quick. Listen, I know it’s tough, I know it’s a stressful business but if you decide that, “You know what? I don’t wanna be a stress case. I’m gonna start taking steps and taking action that is gonna allow me to alleviate stress, you’ll find your own ways to do that. Alright? I hope this was helpful. Don’t stress about not being stressed. I’ll see you next week. Go out there, profit in business. Thrive in life. I’ll see you later.